This stylus profiler can be used to perform nanometer scale height, step and surface roughness measurements on an array of sample types. Thin Film Inspection - monitoring deposition and etch rates and thin film stresses. 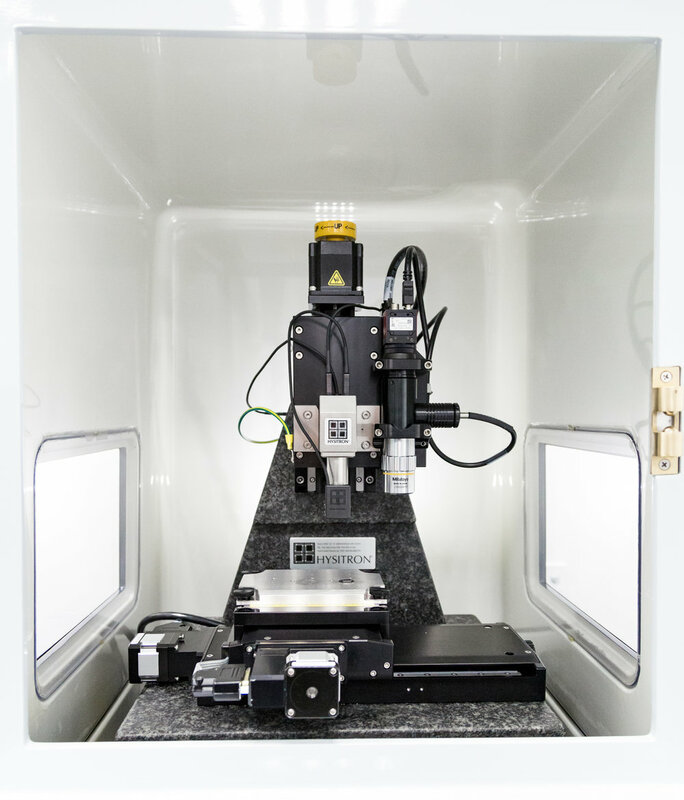 This is an automated nano-mechanical test instrument for measuring the hardness, elastic modulus, fracture toughness and other mechanical properties using controlled nanoindentation of materials. Imaging of indentations can then be carried out with the indenter head or the integrated optics. Our system is installed on low vibration platform, improving measurement quality. This analyser has a flexible video system which is used for measuring Contact Angle, Surface Tension, Interfacial Tension, Wettability and Absorption. Surface Energy can also be measured as a direct function of Surface Tension and/or Contact Angle. The instrument hardware consists of a high resolution CCD camera, a zoom microscope, an adjustable sample stage, a PC-controlled syringe pump, PC-controlled lighting (front & rear) and the PC itself, which hosts the PCI frame-grabber card (for video capture). The versatility of the system allows it to be configured in a number of different ways, although the vast majority of measurements are taken in the configuration shown in the image here/above/below. This versatility is echoed within the analysis software, where image analysis can vary between fully automatic and fully manual, depending on the complexity of the image. The analysis is performed on true gray-scale images (not silhouette-style images! ), thereby enhancing the sample detail and explicit graphics allow the operator to determine exactly where the software algorithms have found the drop and specimen edges. Critical Micelle Concentration & Critical Wetting Tension. Many of these parameters are available as dynamic measurements (i.e. as a function of time) and the time-scale can vary from 1/60th of a second (single image) to several hours. The measurement intervals can also be varied non-linearly in order to track Adsorptions much more efficiently.